Out of all Isaac Newton’s myriad interests, alchemy appears to have been his passion. 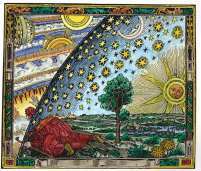 His famous works on optics, mechanics and mathematics were mere side-thoughts in comparison to the thirty years he spent on alchemy. He read hundreds of alchemical texts and wrote more than one million words in his notebooks. These notebooks include experimental notes, which appear to only hint at the many hours spent in his laboratory. His thoughts on alchemy developed throughout his life but he seems to have never let go from the belief in a ‘subtle, vegetative agent’ that produces all of nature’s marvellous forms. He kept his studies secret because ‘vulgar eyes’ were not yet worthy to view the noble truths he was attempting to uncover. Both ancient and contemporary sources influenced his ideas: the Stoic philosophy of Greece and Eiremaeus Philalethes among these. Theology had perhaps the greatest influence on his thought. After all, to know the nature of God was the end of all his studies. With this common link, his work on alchemy was directly related to his work in other sciences. Finally, Newton’s reputation today is as a ‘man of reason’; his studies in alchemy do not contradict this. Newton was devoted to God and alchemy was simply a means to the end of unveiling the divine workings of nature. It can be said, without too much doubt, that today we have entirely different notions of what alchemy and chemistry involve than those which Newton believed in the 17th Century. The modern conceptions we have of terms used in the past are necessarily irrelevant when we are studying Isaac Newton’s work, because they postdate the work itself. This being said, there was a distinction made between chemistry and alchemy in Newton’s time. Newton considered ‘vulgar chymistry’ as merely the imitation of mechanical changes in nature, whereas the art of inducing vegetation (alchemy) was a much nobler and more divine pursuit. Alchemists sought spiritual perfection or the knowledge of perfection, not a study of nature for its own sake. However, there was some overlap between the fields of alchemy and chemistry. Both shared a similar interest in the manipulation and transformation of the different forms of matter by chemical techniques. Even sceptics of Newton’s work as a pure ‘alchemist’, such as Marie Boas Hall, believe the work was deep and prolonged. Newton’s goal was to penetrate the symbolic vocabulary of alchemy; this required intensive reading of alchemical texts. It also required extensive reading (in order to collate accounts from many different texts to find the truth within). As Jan Golinski points out, ‘Newton was probably better acquainted with the whole body of alchemical writing than anyone before him, certainly more than anyone since…’ Newton acquired manuscripts and books from alchemical sources going back to Hermes Trismegistus. For Newton, encountering many different systems of thought tended to be complementary rather than competitive because each different author could possess a single aspect of the fundamental Truth. The assumption is that each author could specialise in their greatest interest. In addition to his heavy regimen of reading, Newton was a keen experimenter; there is a very lengthy series of alchemical experiments recorded in his notebook. He thought that an irrefutable scientific demonstration of alchemical occurrences would provide evidence for the existence and activity of the Christian God. He continued to hold this belief throughout his life. The goal of his experiments was to produce ‘philosophic mercury’ as the first step in the preparation of the Philosopher’s Stone (the elixir of life, and universal solvent). He sought first to extract the ‘mercury of the metals’ by adding lead filings to a solution of mercury, believing the sulphur of lead would precipitate the mercury of lead. He eventually became dissatisfied with this process, instead turning to the higher aim of discovering the ‘Star Regulus of Antimony’- the crystallizing star formation that appears when antimony is prepared from antimony ore. This, he believed, was able to purify gold of any contaminating metals. There was supposedly a correspondence between the antimony regulus and the celestial star, because the lion of the alchemists symbolised antimony ore. Newton claimed to have found in his experiments many examples of the generation of metals by ‘male’ and ‘female’ counterparts (for example, Mars was iron, Venus was copper) and evidence of active principles at work. He also noticed that one substance did not join with all others, only those with which it was related to; the doctrine of ‘like joins with like’ was common in alchemical literature. Early in Newton’s career (while he was still an undergraduate at Cambridge) he began to believe in the ‘aether’, a substance that was thought to be the cause of changes to all forms. It accounted for surface tension (the fly walking on water without touching it), the cohesion of solids, animal motion, static electricity, magnetism and the gravitating principle. This vital agent is diffused throughout all things – it assumed the particular form of the subject so as to be indistinguishable from the subject. Newton called this agent many different things over the course of his alchemical career: the ‘mercurial spirit’, ‘fermental virtue’, ‘vegetable spirit’ and finally the ‘force of fermentation’. It was the natural agent God used to put his will into effect in the natural world. Some time after the publication of the Principia, Newton has a problem with the material nature of the aether; – he could not reconcile this with his theological beliefs – so he dismisses the theory and instead develops the general concept of attractive and repulsive forces. These are influenced by the alchemical principle, with one important difference: the forces were not separate from the matter they inhabited, unlike the ‘seeds’ to be added to the ‘dough’ of matter. They were simply facts of nature; all effected by God in the creation.